Looking At A Popular Question for WJSS: Why Are You Attracted To Black People* And Black Culture*? My friend Keith Thompson suggested, as part of his birthday greeting to me in early September, that perhaps now would be a good time to write a post where I reflect back on this blog, and see where I’ve come from, what I’ve learned along the way. I hadn’t read my About page in some time, but when I saw those words they reminded me that was what I thought was the original purpose of the journey–to reflect on why I seemed so obsessed with having to connect with black people after leaving New York City, and the realization that those connections were always important to me throughout my lifetime, but I hadn’t had to think about them on a conscious level because they were simply there. It’s when they were taken away that I realized I missed having my life enriched by being around all different kinds of people. There’s so much that has happened over the past three years as I look over my writings, with of course the road taken, shifting and forking off in different directions. It’s only natural that the thing we think we are exploring leads us into other terrain. The twists and turns come from my self-education, what I learned from listening to others’ stories, my increasing self-awareness of how my own white privilege has shaped my perspective, and most of all, the increasingly violent landscape that has black people in this country openly endangered. Well, they have been for centuries, and yet it’s escalated to the surface in these past three years since I started writing, and brought into the public eye with cell phone video recording of the excessive use of force by police officers on black men and women, and killing of black men and women primarily by police officers. Of course, being white, I have the privilege to say, well, today I’ll write about what I’ve learned about the “why” of being attracted to black people and culture, and tomorrow I’ll write about B and the next day C.
But that first question does seem to be the one that most people ask when they learn about my passion for writing about race. I’m pretty sure my friends on Facebook must also be thinking what’s up with Wendy?, when all I share are posts related to race, racism, and black popular culture. So sometimes I share some cute video of a white toddler singing just for good measure, to balance things out, throw my friends off. What do you feel is lacking in you, in your life, your upbringing, that you are trying to fulfill by your attraction to black people and black culture? What immediately comes to mind are a few things. On a lighter note, from the time I was a little girl, I loved listening to music, and I loved to dance. The music I most connected to was soul music, R & B, Motown. My parents had these records at home. I could pull out a Supremes album, or later on, Diana Ross, the Fifth Dimension, Herb Alpert and the Tijuana Brass (I know–Herb’s not black), Al Green, Curtis Mayfield. I remember my aunt playing Sly and the Family Stone, and I remember discovering and falling in love with Michael Jackson and The Jackson 5, and dancing to ABC in my basement. I couldn’t dance to rock and roll, and didn’t feel connected to it or have a desire to listen to it, except for a few select songs like Stairway To Heaven, or later, The Rolling Stones’ Angie or Brown Sugar, both latter songs of course influenced by the Stones’ love for blues music, as all rock stemmed from. So, one thing that was missing for me in white culture was what I felt was a lack of soul in the music that white people were making. I remember too, that, it was the norm in our family to hold in high reverence, artists, entertainers, and athletes of color, to have these talents be the topic of conversation. I remember asking my parents what movie they were going to see, and having them answer, Shaft, and my dad’s ability to recite verbatim at the dinner table, scenes from Richard Pryor’s film, Stir Crazy. And, it wasn’t like they ever talked about it like, hey, look at us, we are white liberals, and we support black culture, and feel it’s important to do so. It just was, and I think I now realize that that inclusiveness of a diverse array of cultures represented in our home as something normal, gave me the gift of wanting to always be appreciative of the artistry of people of color, in particular, black people, which I believe has to do primarily with growing up a child of the 1960’s and 1970’s. As I write that paragraph, I can’t help but notice that I’ve named only black people who fall under the category of entertainers. I realize that that can be problematic, since it has long been an issue, for the white person to see black people as there for entertainment for white people to enjoy and yes, exploit, over the ages. I won’t make any excuses for being a white family that holds up black entertainers, but doesn’t recognize the achievements in all facets of life that black people have made in this country and beyond. My only thoughts on the matter are that I come from a family that didn’t talk about world politics, history, literature or other high-brow topics around the dinner table. If we did, I don’t remember it. My Mom and Dad, both bright people, and young parents when they had my sisters and me, ran their own retail gift shops. At the dinner table we talked about dish towels, Danskware, and Dr. J. Also, during this time, and still sparsely today, did we or do we see or hear in our media, or our schoolbooks, the achievements of extraordinary black Americans who have contributed to science, business, design, philanthropy. And, if we are not allowed to witness these contributions or the existence of black doctors, lawyers, scientists, writers, in television, movies, the news, in magazines, then we don’t believe they exist and so black people just must not be these things. It was only as an adult that I recognized this on a conscious level. My white privilege enabled me to not have to notice that. I remember shelving magazines as part of my volunteer work at the African American Resource Center at the Rudisill Library in Tulsa, Oklahoma when I lived there from 2003 through 2006. I came upon the magazine Black Issues Book Review. As I picked up an issue and thumbed through it, it embarrasses me to admit I had the thought, not a negative thought, but a curious one, hmmm, I wonder why there is a separate magazine for black writers. A second later, I answered my own question, as my eye caught the stack of Black Enterprise magazines on the shelf above me. It’s because white people don’t give any space to black writers. White people don’t give any space to black people who achieve in business, or any area of life, and so that is why I am sorting magazines like Jet, and Ebony, and Sepia, and Black Issues Book Review. Black people had to create their own sources of media to see themselves exist. What else was lacking in myself that draws me to black culture? An ability to express myself without feeling self-conscious and uninhibited. In Go Ahead Girl, written in March 2012, I wrote about my attraction to the demonstrativeness in black culture, the ability to say Go Ahead Girl! and say it with feeling, to say what you mean, to throw shade, to dance like no one’s watching. I said it with the knowledge and intention to note that black people are not one monolithic dancing, sassing machine. That there are many black people who would consider themselves shy or inhibited, who will say they have no rhythm, who aren’t so quick with comebacks. We are all individuals who belong to the same human race, and each of us have qualities that make us unique. Yet, black people speak to me, and write about these characteristics of black culture that I wish I could show more outwardly. So, do I say it is my Eastern European heritage that makes me an uptight, white person? Or my family’s teasing when family members, myself included, or strangers displayed overly enthusiastic self-expression? Perhaps, it’s a combination of the two. The weightier matter that I know shaped my strong desire to connect with black people, again from a very young age, was the inequity and racial hatred of black people I witnessed during the Civil Rights era. Though it was from a distance, living in the Northeast, watching the horrors before me on television of events in Selma and across the nation, I also noticed matters of racism, and lack of inclusion of black people in the white bubbles (as author of Waking Up White, Debby Irving, calls it) we white folks tend to live in. In my blog post Thalia, about one of the few black girls in our class before busing was instituted in the third grade, I recall how some of the white girls in my circle of elementary school friends unconsciously wrecked Thalia’s birthday party year-after-year. These feelings of deep sadness over the repercussions of racism drew me to want to connect, be kind, and show black people that I was their friend. A simple act as a child and teenager, and yet not enough now, as a middle-aged white adult living in dire times for black people. Though the journey through this blog has made me become more and more awake to how my own white privilege, and the systems of white privilege, and systemic and institutional racism that have continued to keep things from being far from equal for black people in this country, I need to step up and do more. I thank you, Keith, and Adrienne and Debby, and the many other readers who have asked me the question, albeit in a variety of ways, Why are you attracted to black people and black culture? Why are you attracted to black people and black culture? Please share about a culture, race, ethnicity, different from your own that you are attracted to, and please share why. Try using Debby Irving and Adrienne Wallace’s framework of looking at what may have been lacking in your culture or upbringing that draws you to a particular culture. *On using the term black people and black culture, I have a good friend, who I respect a great deal, an Anthropology professor, who finds the use of these terms problematic. I do want to speak on the reason on why I am continuing to use these terms, but that is a post in and of itself that I won’t address here, except to say, that when I use the term black people, I am not lumping all black people that exist into one, monolithic group that all think, feel, and behave the same way. The same goes for the term black culture. On the matter of who is included in these groups, and intersectionality, I again, hope to explore and explain my use of those words/terms, and am very open to feedback on people’s feelings about the use of these words and terms when I write the post on that topic. Hi, there, my so, so very dearly sweet and special, so, so very dearly precious white and Jewish friend and sister who you are For Always so, so very much, Wendy Jane!!!!!! Wow, wow, wow and wow and wow and a zillion wows, sister, I so love and like this very beautiful and lovingly heartfelt, caring blog post article of yours! I love so dearly and in my very heart so, so very close to my heart how you so very much love and cherish us as black people, and love so and like so black culture, black music, education, books, entertainment, the arts, and how you have such a deeply genuine concern for our health, safety, and that we receive all of the good there is and such blessings in our very lives, sister. I think that it is possible as it so very evident in your life, sisterfriend, and in your love for us that you can do so and learn how to love without falling back on white privilege and racism. I think your very love and life, Wendy Jane, attests to the very fact and reality that your love and cherishing us as black people is very good, whole, and so, so very deeply sincere. There is absolutely nothing wrong with this love and attraction you have had all of your life, sister, and I think that this is a gift and a blessing from our Good God and how our Great and so, so very loving Good has made you, sister!!!!!! Wendy Jane, I loved reading about your parents’ great love for black music,and more about your family history and background with their interest in black music and black culture. I love how you, your parents, and the rest of your family are and have been so demonstratively expressively-this is so cool, Wendy Jane!!!!!! I think that this all is so cool, my friend! 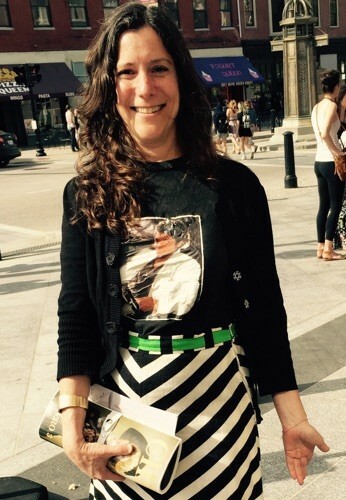 Wendy Jane, I love this so cool photo of you, my friend, and your so very dear and cool shirt with our precious Michal Jackson pictured on it, sister! Yay, Wendy Jane, yay!!!!!! I think your very deeply sincere love and caring for us as black people who I know you so much love, like, and cherish is very real, whole, and good, sister!!!!!!! I think of your attraction to a black man as someone very special romantically as a great possibility is so very precious and so very dear, sisterfriend!!!!!! I worry that when people question you about why do you love black people and why are you attracted to black culture that I so hope that they don’t even slightly find your love for black people and culture odd or wrong, Wendy Jane!!!!!! And I don’t want you to be at all pressured to feel differently because of these questions from people or any other comments you may receive which don’t acknowledge the very beauty and precious quality of your very deep love in all of its facets, Wendy Jane!!!!!! We are sisters in so, so very many ways, Wendy Jane!!!!! I feel like I am your sister and your twin in spirit because I have the same kind of love towards the other way in that I as the lesbian black woman who I am have for all of my life as long as I can remember even before my family and I moved to the then integrating majority white suburb of Cleveland Heights, Ohio in November 1967 of my kindergarten year when we left one of the inner city areas of Cleveland that this special and ardent love I have For Always had for white people, very, very especially white women, has For Always been there, sister!!!!!! Even when we were still in the inner city, I was in nursery school at the Catholic church we were members of which mainly had white church goers. I was the only black child in my nursery school from the age of 3 to 5 and my dearest and darling nursery school teacher was a white woman of German descent and ancestry. I just loved her so, so much, Wendy Jane! I had been raised Catholic but I left the Catholic church when I was 20 but I am still a Christian just not Catholic. My parents came from a Baptist background but my mother converted to Catholicism when she was a teenager and would never say why-she was very secretive and mysterious. So even before we moved to Cleveland Heights, I’ve known all of my life from a very young age remembering all of this that I have had a special love and tug in my heart pull toward white people!!!!!!! As I was growing up and through my teens and early adult years I would go in and out of denial about being gay and I tried to be involved with men but no go for this 100% lesbian!!!!!! I had been so pressured and so lambasted to not love white persons, and to not be attracted to white women who I have For Always love and will For Always do so as people, friends, and sisters, and how I have been and will For Always be only and exclusively very, very intensely attracted to white women hoping to be in a relationship whit a white woman again someday, sister! I was so berated and pressured to not love white women that I even tried to be attracted to other black women and other nonwhite women but I couldn’t make something happen no matter how hard I tried to feel attracted to other women other than white women-I tried and tried and tried but the feelings just weren’t there and I just couldn’t make something happen that wasn’t a part of my nature, Wendy Jane!!!!! I’m not deliberately trying to not be attracted to nonwhite women, sister!!!!!! My very, very intense attraction to white women just happens so naturally without effort and so spontaneously, sisterfriend!!!!! Over a lifetime history of this very same lifetime ardent love I know that our Good God made me this way and this is just how I’m wired, sister!!!!!! Wendy Jane, I wanted to fully answer the question you asked of all of us with this answer of mine so far. I know that I grew up in a then majority white suburb since kindergarten but I think that this love for reaching out to white people, very, very especially white women as the lesbian black woman who I am, is there because of my love all of my life even before moving to Cleveland Heights, and not only just because I grew up most of my childhood, pre-teen years, and teen years in a majority white suburb and church, sister!!!!!! I can just imagine how some white people may question you and think you are disloyal to white people because of your love because I as your spiritual twin sister have been accused of being disloyal to other black women and black people in general because of my love, Wendy Jane!!!!!! Definitely not so!!!!!! We have such a love and concern for all people and all of their humanity as our Good God’s children even with our very special love for black people and white people, respectively!!!!!!! With my special love and outreach to white people as the very liberal, open-minded, and progressive Christian black woman who I am, and my so very dear and ardent love for white women as the lesbian black woman who I am, I’m not rejecting other black women and black people as a whole!!!!! I try so hard to be very kind and respectful to other black women and other black people, and ultimately do all of our Good God’s children!!!!! And I know, Wendy Jane, that you’re not rejecting other white people and other people who aren’t black because of your very special love for black people, sister!!!!!! Wow, sister, I am so, so very passionate about all of this as you can see here (SMILE!!!!!!!) And my very special love for white people, very, very especially for white women, isn’t because of the bad experiences I’ve had with other black women and black people in general, sister, as I know you know, Wendy Jane, but some other people would question me for this!!!!! I know that there are wonderful, loving, caring, and brilliant black women and other nonwhite women, and black people in general and other nonwhite people in general out there!!!!! My solely, only, and exclusive preference for white women is not a rejection of other black women and other nonwhite women!!!!!! This is just how I am because our Great and Sweet God made me this way and this is just how I am wired, sister!!!!!! Sisterfriend, I am just so, so very blessed and so, so very grateful to you as my so very dear white and Jewish friend and sister, and that you have been so, so very open to me and all of my sharing, and you, sisterfriend, and your absolutely fantastic WJSS just mean so, so very much to me, my friend Wendy Jane!!!!! Your Valentine’s to all of us as black people just went straight to this lesbian black woman’s very heart, sister!!!!!! I thank-you, thank-you, thank-you so, so very much and so, so very profusely, sister, for being the wondrously wonderful you who you are For Always, and for your absolutely fantabulous WJSS, and how you are there for not only me but for all of us, Wendy Jane!!!!!! Thank-you so For Always!!!!!! Please have a wondrously wonderful weekend, my so, so very dearest friend and sister, Wendy Jane!!!!!! Again, I thank-you from the deepest depths of my very heart with all of my very heart, sister!!!!!!! Thank you. There is so much here that you speak to and I thank you so deeply for the loving attention, and yes, passion in which you share your own experiences, and as always your words of support and belief in my passion to explore race and my attraction to black people and black culture. We must be spirit twins as you say, and when you share with me about your growing up, and your trying to push away your feelings about being gay, or feeling you had to try and be attracted to black women, well, I just wish I could hop on a plane to Iowa City, and sit with you for 24 hours straight in a coffee shop, just talking, talking, talking about all of this. I DO have to interview you for the blog–I promise we will make that happen one day. I think a lot of people are just curious about my passion/attraction for the subject, but like you say some people probably think it’s odd or worse, have some kind of disdain for it. But, I’ve learned over the years, even being the people pleaser that I am, that I cannot take things people say personally, and I know the place where I am coming from, and not everyone has to like or agree with my thoughts and feelings. One thing I did want to note is that in this piece I am saying that my family was not very demonstrative in the area of enthusiastic self-expression, and so I think that made me a more inhibited person, and I wish I could naturally be that way. Thank you again Sherry for being gloriously you! I enjoy reading a post that will make men and women think. Also, thanks for allowing me to comment! thanks so much for reading, and commenting!